The kids and I love Advent, and all the fun preparations for Christmas. We have loads of little traditions that we look forward to, and try to focus on sharing the story of Jesus’ birth in creative and fun ways. One of these traditions is our Advent basket. You may do something similar in your home – but, if not, I really recommend this as SUCH a simple but effective Advent tradition for kids. 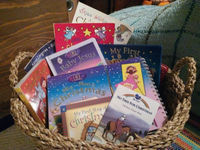 Very simply, an Advent basket contains Christmas books and other resources which come out each year at the start of Advent, and encourage playful and spontaneous re-tellings of the Christmas story throughout December. It really doesn’t matter what you use! It’s always exciting for kids to re-discover books and toys that they’d forgotten about. We haven’t gone out of our way to fill it: when we had kids, we realised that people would often buy them a Nativity storybook at Christmas. Funnily enough, we weren’t really very motivated to look at it on/after December 25th! But we didn’t want to lose it by the time next Christmas rolled around. Occasionally, I’ll buy a resource for our basket, if I’ve seen something really good. But the vast majority of items have come to us as gifts. So what’s in it? Absolutely loads, so I’m not going to bore you with everything, but here are my choice items! I love a nativity set – but they’re often fairly delicate, and very much ornaments rather than play-things. It’s great to try and find, if you can, a really solid, robust set that will stand up to the play of a toddler. Small children will soon be able to start telling the story of Christmas very quickly with some figures to play with. This is the one we have. It’s not cheap, but it’s lasted for years and looks beautiful as an ornament as well as being suitable for play. children love to hear many times each Advent. Saint Nicholas: The Real Story of the Christmas Legend is the book we have, which has engaged my kids for the last few years, but I recently bought Just Nicholas, as everyone seemed to be recommending it! My verdict? Both books are reasonably wordy, so it depends on the concentration level of your child, but mine have enjoyed ‘Saint Nicholas’ from the age of about 3 or 4, as there are fewer words per page. ‘Just Nicholas’ is longer, and perhaps better suited to primary-aged children – this book also has more contemporary illustrations, and a full explanation of the gospel that Nicholas believed, which inspired him to be so generous. So – both are good, take your pick! 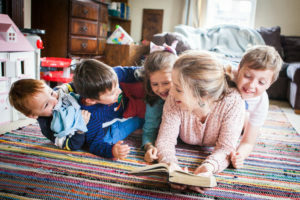 If you have babies or toddlers in the house, a board book (or three) is an absolute must! My youngest boys are 4, and they still love to look through these chunky board books. It’s great to include in your basket a book which has an additional ‘play’ element. 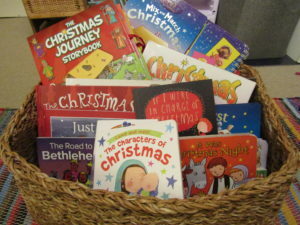 The Christmas Journey Storybook is one of our newer additions to the basket, and it’s a lovely pop-up book, with cardboard play figures to interact with each scene. We also have a ‘Mix and Match Christmas’ book, which is sadly no longer available, but you may be able to find it second-hand. You can, of course, tell the straight Christmas story from this book – but my kids are always far too distracted by making crazy sheep-angel-innkeeper characters from the flaps at the side! This deserves a section on its own because it’s just beautiful, and every family should own a copy. I love the illustrations of Catalina Eccheveri, who illustrates loads of books published by the Good Book Company, and it’s well-written, too, with language that preschoolers can understand. There’s also an activity and colouring book version, which is great if you’re looking for something to mix up the reading books. Our kids will watch their fair share of Christmas tripe this December – so it’s always lovely to have a Nativity DVD to whip out whenever we need reminding what this season is really all about! Auntie Carol (a total legend in our family when it comes to excellent Advent resources!) bought us The Road to Bethlehem when Mister was small, and all four kids have enjoyed it ever since. It’s lovely: animated, fun, easily comprehensible by toddlers, and less than 10 minutes in length, so you don’t need a big attention span. The book which accompanies it is good too. Now it used to be produced as a book with accompanying DVD (this is what we have) – but it looks as if it’s been repackaged as a book plus digital download of the animation. Click here to investigate further. If your kids can cope with a half-hour film, then The Cow That Almost Missed Christmas, which will be shown on CBeebies at 4.30pm on Wednesday 19th December, is definitely one to catch. It’s a fun re-telling which has a lot ‘added’, but has a really sharp focus on the real meaning of Christmas too. For a secular TV channel, I’m impressed! And for older kids and teenagers, why not grab a copy of The Nativity? I was really moved when it was first shown on the BBC a few years ago. 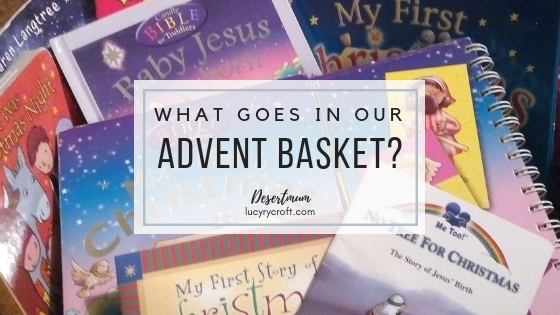 Naturally, your Advent basket will be fairly book-heavy, so do look out for non-book items and grab them while you can – there aren’t many, and they tend to be available for very limited periods. I’ve seen Nativity building cubes, as well as Nativity Russian dolls – but jigsaws are usually easy to get, and provide hours of fun. Unfortunately, these jigsaws are no longer available, which is such a shame as they’re so well made and have easily withstood six Christmases of heavy play from the Desert kids. But a quick Google, and you’ll find suitable alternatives – like these ‘Happy Birthday Jesus’ jigsaws, for example. This is a new addition for 2018 – and yes, it’s from Auntie Carol! She ordered it early so that we could enjoy playing with it through Advent. I wrapped it up for the kids to discover in their basket this weekend – and so far they love it! It’s a lovely step up from the chunky wooden Nativity, with more detailed figures who have moveable limbs, so it’s great for older preschoolers and primary-aged kids, especially those who enjoy Playmobil and Lego throughout the year. Ebay has some great bargains on Playmobil Nativity sets right here. 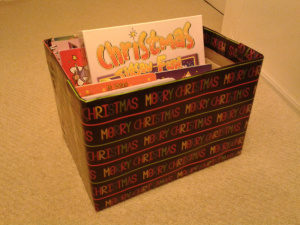 It’s been six years now since I first put together an Advent box, and the little boy who was three is now nine! Clearly, he needs something a bit more stimulating than touchy-feely books. Many of the books mentioned above are great for older primary kids, and Mister still enjoys them, so if you have KS2 kids then I’d still definitely recommend many of the above. Boring Bible: Crackers Christmas (Andy Robb) – aimed at the 7+ age group, this looks fast-paced, fun and thought-provoking. XTB: Christmas Unpacked (Alison Mitchell) – we’ve used XTB Bible-reading notes before, and they’re great. This would be an excellent way of reading the Bible with an older child during Advent. Disclaimer: I haven’t used either of these, so can’t recommend personally, but knowing what I do about the publishers and authors, they will probably be excellent! Over to you: do you have a similar tradition? What resources do you recommend? Great idea. Wish I had done this when mine were young. Will look out for some older children books but like you our wooden nativity is still going strong after 11 years! This is fantastic! What a great idea to gather all the things together in one spot. Ours are all in different places in the house which makes them harder to reach for in a given moment! Do you put all these things away for the other 11 months of the year to keep them fresh for Advent? I’ve kept all our Christmas books out year round but the novelty of finding ‘new’ books in the basket would be great.